Manager Jim McIntyre was delighted to see Ross County pick up maximum points on their first home outing of the season with a 2-0 win over Hamilton. 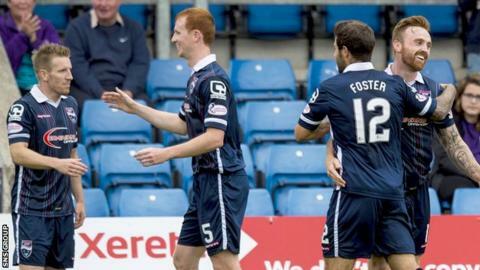 The Staggies lost their first seven league games last year and needed a strong finish to avoid relegation. "We saw what happened last season when you don't manage that - the nervousness that can build." There were certainly anxious moments for the home side as Accies opened strongly. But County keeper Scott Fox made a good save from Ali Crawford's penalty and Craig Curran knocked in the first of his two goals soon after. "Hamilton started very well and we have Scott Fox to thank for keeping us in the game," added McIntyre. "We weren't at our best at all but the grit and determination the players showed pleased me. "When you bring in 12 new players it's going to take time and I know there is far more to come. "We know how hard it is to win at this level. Hopefully, that will set the tone. We need to be ruthless when opportunities arise and we took ours today." Of goal-hero Curran, the manager added: "I thought his work-rate, as always, was exemplary and he really leads the line well." Hamilton boss Martin Canning was frustrated not to build on a bright start, with his team yet to score in two Premiership matches. "Obviously, we didn't score the penalty, I think at 1-0 and the way that we started the game we would have gone on to win the game," he said. "But it's such small margins, we miss the penalty and they go up the park and get a soft goal from our point of view and the game changes on that. "We started the game well and we will always try and get the ball down and pass it. I thought for large spells we dominated and we were excellent at times. "But the turning point is when we miss the penalty and conceding a goal right on half-time gave us a mountain to climb." Accies struggled for goals in the second half of last season and opened this campaign with a 0-0 at home to 10-man Partick Thistle. "When teams sit off you as they can do especially if they are two goals up, it's then up to us to go and break them down and I thought we were a bit one dimensional trying to play through the middle of them," explained Canning. "I think we might have gone wider and put the ball into the box which may have given us a better opportunity and that is something that we can work on." On the prospect of bolstering his squad, he added: "I think we have a bit of scope to bring players in but I don't want to just be bringing players in for the sake of it, I've got to be bringing players in who are better than what we have. "A lot of what we are doing is right, last week we were excellent and today we had spells where we were excellent."